Author(s): Konstantinos Dimos. Department of Materials Science & Engineering, University of Ioannina, GR-45110 Ioannina, Greece. This review deals with the promising newest carbon-based nanomaterial; Carbon Quantum Dots (CQDs). CQDs demonstrate optoelectronic properties comparable to conventional inorganic semiconductors, however are environmental friendly and benign. They possess complicated structures, particle sizes up to 10 nm and upon surface passivation and/or functionalization their optoelectronic properties are critically improved and tuned. Although there are a few recent reviews on this topic, the majority of them emphasize on CQDs applications or even the synthetic procedures followed to acquire CQDs. In contrary, this review refers in brief to the aforementioned and focuses on the surface passivation and functionalization routes and therefore the functional groups and heteroatoms used for the development of high quality CQDs. Introduction and doping with appropriate heteroatoms is the key point to tailor made features of CQDs and thus organic chemistry provides the vital background for the essential functionalizations. 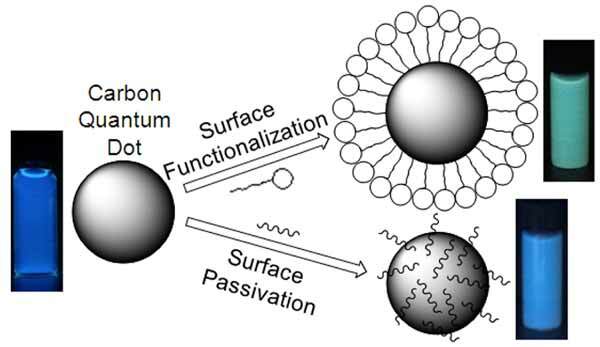 Keywords: Carbon quantum dots, surface passivation, organic functionalization, fluorescence, luminescence, optoelectronic properties, synthesis, applications. Affiliation:Department of Materials Science & Engineering, University of Ioannina, GR-45110 Ioannina, Greece. Keywords:Carbon quantum dots, surface passivation, organic functionalization, fluorescence, luminescence, optoelectronic properties, synthesis, applications. Abstract:This review deals with the promising newest carbon-based nanomaterial; Carbon Quantum Dots (CQDs). CQDs demonstrate optoelectronic properties comparable to conventional inorganic semiconductors, however are environmental friendly and benign. They possess complicated structures, particle sizes up to 10 nm and upon surface passivation and/or functionalization their optoelectronic properties are critically improved and tuned. Although there are a few recent reviews on this topic, the majority of them emphasize on CQDs applications or even the synthetic procedures followed to acquire CQDs. In contrary, this review refers in brief to the aforementioned and focuses on the surface passivation and functionalization routes and therefore the functional groups and heteroatoms used for the development of high quality CQDs. Introduction and doping with appropriate heteroatoms is the key point to tailor made features of CQDs and thus organic chemistry provides the vital background for the essential functionalizations.